This article is about books written about the life of Jesus. For the Good News of salvation through Jesus, see The gospel. For other uses, see Gospel music, Gospel (disambiguation), or The Four Gospels (disambiguation). Although Bibles place Matthew, Mark, Luke, and John before the letters of Paul, in reality they were written after. 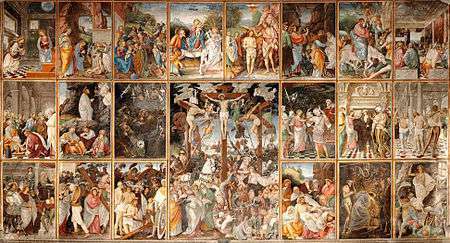 Christianity places a high value on the four canonical gospels, which it considers to be a revelation from God and central to its belief system. Christianity traditionally teaches that the four canonical gospels are an accurate and authoritative representation of the life of Jesus, but many scholars and historians, as well as some liberal Christians, believe that much of that which is contained in the gospels is not historically reliable. This position however, requires a liberal view of Biblical inerrancy. For example, professor of religion Linda Woodhead notes some scholarship reinforces the claim that "the gospels' birth and resurrection narratives can be explained as attempts to fit Jesus’s life into the logic of Jewish expectation". However, New Testament scholar N. T. Wright holds firmly to the historical authenticity of the death and resurrection of Jesus, stating that, of the whole Bible, this is the story with the most overwhelming historical evidence. The word gospel derives from the Old English gōd-spell  (rarely godspel), meaning "good news" or "glad tidings", and is a calque (word-for-word translation) of the Greek word εὐαγγέλιον, euangelion (eu- "good", -angelion "message") or in Aramaic (ܐܘܢܓܠܝܘܢ ewang'eliyawn). The gospel was considered the "good news" of the coming Kingdom of Messiah, and of redemption through the life and death and resurrection of Jesus, the central Christian message. The Greek word euangelion is also the source (via Latinised evangelium) of the terms "evangelist" and "evangelism" in English. The authors of the four canonical Christian gospels are known as the Four Evangelists. Paul the Apostle used the term εὐαγγέλιον (gospel) when he reminded the people of the church at Corinth "of the gospel I preached to you". The earliest extant use of "gospel" to denote a particular genre of literature dates to the 2nd century. Justin Martyr (c. 155) in the Apology wrote of "...the apostles, in the memoirs composed by them, which are called Gospels". More generally, gospels compose a genre of early Christian writings. Gospels that did not become canonical also circulated in Early Christianity. Many, such as the work known today as Gospel of Thomas, lack the narrative framework typical of a gospel. Scholars hold a wide spectrum of views on the origins and composition of the gospels. John Riches states the mainstream view: "Many scholars doubt that the Gospels were written by eye-witnesses as their attributions seem to suggest: there is too much evidence of reworking oral traditions and of straight borrowing from other Gospels to make this likely." For example, the vast majority of material in Mark is also present in either Luke or Matthew or both, suggesting that Mark was a source for Matthew and Luke. He writes that the four canonical gospels "were probably all written by the end of the first century". But they did not yet at that time have a consistent narrative. "In 170 Tatian sought to find a solution by composing a single narrative out of Matthew, Mark, and Luke, with some additional oral material." Richies concludes that the gospel passages themselves can be unclear, and some of the messages within are "straightforwardly ambiguous" and intended to be "metaphorical" or "poetic". 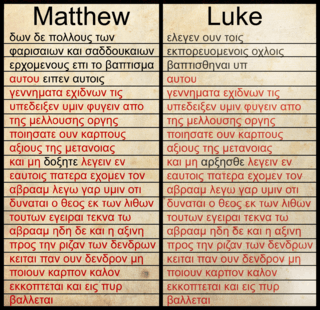 Comparison of Matthew 3:7-10 and Luke 3:7-9. Common text highlighted in red. The gospels of Matthew, Mark, and Luke are considered synoptic gospels on the basis of many similarities between them that are not shared by the Gospel of John. "Synoptic" means here that they can be "seen" or "read together," indicating the many parallels that exist among the three. The synoptic gospels are the source of many popular stories, parables, and sermons, such as Jesus's humble birth in Bethlehem, the Sermon on the Mount, the Beatitudes, the Last Supper, and the Great Commission. The fourth gospel, the Gospel of John, presents a very different picture of Jesus and his ministry from the synoptics. In differentiating history from invention, some historians interpret the gospel accounts skeptically but generally regard the synoptic gospels as including significant amounts of historically reliable information about Jesus. Of the many gospels written in antiquity, only four gospels came to be accepted as part of the New Testament, or canonical. An insistence upon there being a canon of four gospels, and no others, was a central theme of Irenaeus of Lyons, c. 185. In his central work, Adversus Haereses, Irenaeus denounced various early Christian groups that used only one gospel, such as Marcionism which used only Marcion's version of Luke, or the Ebionites, who seem to have used an Aramaic version of Matthew as well as groups that embraced the texts of newer writings, such as the Valentinians (A.H. 1.11). Irenaeus declared that the four he espoused were the four "Pillars of the Church": "it is not possible that there can be either more or fewer than four" he stated, presenting as logic the analogy of the four corners of the earth and the four winds (3.11.8). His image, taken from Ezekiel 1, or Revelation 4:6–10, of God's throne borne by four creatures with four faces—"the four had the face of a man, and the face of a lion, on the right side: and the four had the face of an ox on the left side; the four also had the face of an eagle"—equivalent to the "four-formed" gospel, is the origin of the conventional symbols of the Evangelists: lion, bull, eagle, man. Irenaeus was ultimately successful in declaring that the four gospels collectively, and exclusively these four, contained the truth. He also supported reading each gospel in light of the others. There was also another order, the "western order of the gospels", so called because it is typical for the manuscripts which are usually a representative of the Western text-type. This order is found in the following manuscripts: Bezae, Monacensis, Washingtonianus, Tischendorfianus IV, Uncial 0234. Although there is no set order of the four gospels in patristic lists or discussions, D. Moody Smith suggests that the standard order of Matthew-Mark-Luke-John "projects a kind of intention that can scarcely be ignored". The preface to Luke (1:1–4) is a possible explanation for that Gospel’s canonical placement after Matthew and Mark, for its non-pejorative reference to previous "attempts" (επεχειρησαν) at writing an account of what Jesus said and did can be understood in canonical context as referring to the Gospels of Matthew and Mark. Goswell concludes by suggesting that the self-reference to "this book" in John 20:30, "can be taken as an implicit acknowledgment of other books, namely the three preceding Gospels". Medieval copies of the four canonical gospels are known as Gospel Books or also simply as Gospels (in Greek as Tetraevangelia). Notable examples include the Lindisfarne Gospels (c. 700), the Barberini Gospels, Lichfield Gospels and the Vienna Coronation Gospels (8th century), the Book of Kells and the Ada Gospels (c. 800) or the Ebbo Gospels (9th century). Biblical scholars generally agree that early oral traditions about Jesus, along with collections of accounts, preceded the canonical gospels. The dedicatory preface of the Gospel of Luke testifies to the existence of several accounts of the life of Jesus by the time of its composition. The term Luke uses (διήγησις diēgēsis) is a term used in classical Greek for any historical narrative. The term "gospel" is not used in the New Testament text for any of the canonical Gospels, although in later centuries a traditional reading of 2 Corinthians 8:18, "the brother, whose praise is the Gospel", was to sometimes identify this with Luke, and consequently the Gospel of Luke. The majority view today is that Mark is the first gospel, with Matthew and Luke borrowing passages both from that gospel and from at least one other common source, lost to history, termed by scholars 'Q' (from German: Quelle, meaning "source"). This view is known as the "two-source hypothesis". The two-gospel hypothesis, in contrast, says that Matthew was written first (by Matthew the Apostle), and then Luke the Evangelist wrote his gospel (using Matthew as his main source) before Mark the Evangelist wrote his gospel (using Peter's testimony). John was written last and shares little with the synoptic gospels. The gospels were apparently composed in stages. Mark's traditional ending (Mark 16:9–20, see Mark 16) was most likely composed early in the 2nd century and appended to Mark in the middle of that century. The birth and infancy narratives apparently developed late in the tradition. Luke and Matthew may have originally appeared without their first two chapters. The consensus among biblical scholars is that all four canonical gospels were originally written in Greek, the lingua franca of the Roman Orient. Mark: c. 68–73, c. 65–70. Matthew: c. 70–100, c. 80–85. Luke: c. 80–100, with most arguing for somewhere around 85, c. 80–85. John: c. 90–100, c. 90–110, The majority view is that it was written in stages, so there was no one date of composition. Matthew was probably written in Syria, perhaps in Antioch, an ancient Christian center. Mark has traditionally been associated with Peter's preaching in Rome, and it is well-suited to a Roman audience. Various cities have been proposed for the origin of Luke, but there is no consensus on the matter. Ephesus, in Western Anatolia, is a popular scholarly choice for the place of origin for the Gospel of John. Following Raymond Brown's postulation of a Johannine community having been responsible for John's gospel and letters, other scholars have identified localized communities behind each of the other gospels and Q. This assumes the relative isolation of early Christian communities in which distinctive traditions concerning Jesus throve. Other scholars have questioned this hypothesis and have stressed the constant communication between early Christian communities. One of the most important concerns in accurately accounting for an oral Jesus tradition is the model of transmission used. Form criticism (Formgeschichte) was developed primarily by the German scholars Karl Ludwig Schmidt, Martin Dibelius, and Rudolf Bultmann. The oral model developed by the form critics drew heavily on contemporary theory of folkloric transmission of oral material, and partly as a result of this form criticism posited that the Jesus tradition was transmitted informally, added to freely, and was uncontrolled. However, "Today it is no exaggeration to claim that a whole spectrum of main assumptions underlying Bultmann's Synoptic Tradition must be considered suspect." A number of other models have been proposed which posit greater control over the tradition, to varying degrees. For example, largely in response to form critical scholarship, Birger Gerhardsson examined oral transmission in early rabbinic circles, and proposed that a more controlled and formal model of orality would more accurately reflect the transmission of the Jesus tradition in early Christian circles, and therefore that the oral traditions present in the gospels have been fairly reliably and faithfully transmitted. However, other scholars contend that early rabbinic transmissions were not all that concerned with historicity and were not "controlled" until 70 CE. Kenneth E. Bailey (Asia Journal of Theology 5, 1991), after spending a great deal of time in remote and illiterate villages in the Middle East, used his experience with orality in such places to formulate a similar model of controlled transmission within the early Christian communities, but posited an informal mechanism of control. Controlled models of the Jesus tradition, and with them an evaluation of the gospels as possessing greater historical reliability, have been accepted by some scholars in recent years. However Thomas R. Yoder Neufeld (2007) adds that the early followers of Jesus were not interested in simply preserving the past but were also interested in fitting the narratives to suit urgent information, audience interest and creativity in communication and believed that they were in direct communication with Jesus through the Holy Spirit, thus making it still difficult for historians to assess the historical reliability of the oral tradition. With regards to Kenneth E. Bailey's studies, Maurice Casey (2010) writes that they cannot be applied to 1st century Jews as they were about a different culture at a different time. The historicity of the gospels refers to the reliability and historic character of the four canonical New Testament gospels as historical documents. Historians subject the gospels to critical analysis, attempting to differentiate authentic, reliable information from what they judge to be inventions, exaggerations, and alterations. Some Christian scholars maintain that the gospels are inerrant descriptions of the life of Jesus. E. P. Sanders asserts that all four of the Gospels meet the five criteria for historical reliability, but Howard Teeple has concluded that the gospels provide no historical information about Jesus's life since the first gospel account (Mark) may have appeared as much as forty years after Jesus's death. There are positions between these extremes. Some biblical scholars consider the synoptic gospels to contain much reliable historical information about the historical Jesus as a Galilean teacher and of the religious movement he founded, but not everything contained in the gospels is considered to be historically reliable. The baptism of Jesus and the crucifixion of Jesus are events almost universally agreed upon by biblical scholars to be historically authentic. Elements whose historical authenticity is disputed include the two accounts of the nativity of Jesus, as well as certain details about the crucifixion and the resurrection. The four gospels present different narratives, reflecting different intents on the parts of their authors. All four gospels portray Jesus as leading a group of disciples, performing miracles, preaching in Jerusalem, being crucified, and rising from the dead. The synoptic gospels represent Jesus as an exorcist and healer who preached in parables about the coming Kingdom of God. He preached first in Galilee and later in Jerusalem, where he cleansed the temple. He states that he offers no sign as proof (Mark) or only the sign of Jonah (Matthew and Luke). In Mark, apparently written with a Roman audience in mind, Jesus is a heroic man of action, given to powerful emotions, including agony. In Matthew, apparently written for a Jewish audience, Jesus is repeatedly called out as the fulfillment of Hebrew prophecy. In Luke, apparently written for gentiles, Jesus is especially concerned with the poor. Luke emphasizes the importance of prayer and the action of the Holy Spirit in Jesus's life and in the Christian community. Jesus appears as a stoic supernatural being, unmoved even by his own crucifixion. Like Matthew, Luke insists that salvation offered by Christ is for all, and not the Jews only. The Gospel of John represents Jesus as an incarnation of the eternal Word (Logos), who spoke no parables, talked extensively about himself, and did not explicitly refer to a Second Coming. Jesus preaches in Jerusalem, launching his ministry with the cleansing of the temple. He performs several miracles as signs, most of them not found in the synoptics. The Gospel of John ends:(21:25) "And there are also many other things which Jesus did, the which, if they should be written every one, I suppose that even the world itself could not contain the books that should be written. Amen." One important aspect of the study of the gospels is the genre under which they fall. Genre "is a key convention guiding both the composition and the interpretation of writings". Whether the gospel authors set out to write novels, myths, histories, or biographies has a tremendous impact on how they ought to be interpreted. If, for example, Rudolf Bultmann was correct, and the gospel authors had no interest in history or in a historical Jesus, then the gospels must be read and interpreted in this light. However, some recent studies suggest that the genre of the gospels ought to be situated within the realm of ancient biography. Although not without critics, the position that the gospels are a type of ancient biography is the consensus among scholars today. In addition to the four canonical gospels, early Christians wrote other gospels that were not accepted into the canon, some of which are discussed below. The gospel attributed to Thomas is mostly wisdom without narrating Jesus's life. The Oxford Dictionary of the Christian Church says that the original may date from c. 150. It may represent a tradition independent from the canonical gospels, but that developed over a long time and was influenced by Matthew and Luke. While it can be understood in Gnostic terms, it lacks the characteristic features of Gnostic doctrine. The Jesus Seminar identified two of its unique parables, the parable of the empty jar and the parable of the assassin. It had been lost but was discovered, in a Coptic version dating from c. 350, at Nag Hammadi in 1945–46, and three papyri, dated to c. 200, which contain fragments of a Greek text similar to but not identical with that in the Coptic language, have also been found. The gospel of Peter was likely written in the first half of the 2nd century. It seems to be largely legendary, hostile toward Jews, and including docetic elements. It had been lost but was rediscovered in the 19th century. A genre of "Infancy gospels" (Greek: protoevangelion) arose in the 2nd century, such as the Gospel of James, which introduces the concept of the Perpetual Virginity of Mary, and the Infancy Gospel of Thomas (not to be confused with the absolutely different sayings Gospel of Thomas), both of which related many miraculous incidents from the life of Mary and the childhood of Jesus that are not included in the canonical gospels. Another genre is that of gospel harmonies, in which the four canonical gospels were selectively recast as a single narrative to present a consistent text. Very few fragments of harmonies have survived. The Diatessaron was such a harmonization, compiled by Tatian around 175. It was popular for at least two centuries in Syria, but eventually it fell into disuse. Marcion of Sinope, c. 150, had a much shorter version of the gospel that differed substantially from what has now become the standard text of the gospel of Luke. Marcion's version of the gospel was far less oriented towards the Jewish scriptures than the now canonical texts are. Marcion is said to have rejected all other gospels, including those of Matthew, Mark and especially John, which he allegedly rejected as having been forged by Irenaeus. Marcion's critics alleged that he had edited out the portions he didn't like from the then canonical version, though Marcion is said to have argued that his text was the more genuinely original one. Written in Coptic, it contains oracles that would have been used to provide support and reassurance to people seeking help for problems. It is not a gospel in the traditional sense, since it doesn’t predominantly teach about Christ. The Injil (Arabic: إنجيل‎‎) is the Arabic name for what Muslims believe to be the original gospel of Jesus. This Injil is one of the Islamic Holy Books the Qur'an records as revealed by God, the others being the Scrolls of Abraham, the Scrolls of Moses, the Tawrat (the Torah), the Zabur (the Psalms), and the Qur'an. Muslims believe this original gospel to have been corrupted over time, and the teachings of Jesus lost and replaced with false teachings, often believed to be at the instigation of the Apostle Paul. Muslims believe that the four canonical gospels of Matthew, Mark, Luke and John and lost gospels, such as that of Saint Peter, contain fragments of Jesus's message, but that the majority of the original teaching has been corrupted or lost. Agrapha are the collection of religious sayings attributed to Jesus Christ that are not found in the canonical gospels. Godspell is a musical based on the gospels of Jesus Christ. The word "Gódspell" is Anglo Saxon (c. 1000 AD) for Gospel. ↑ New Testament. Encyclopedia Britannica. Accessed November 13, 2016. ↑ The Myth about Jesus, Allvar Ellegard 1992; Craig Evans, "Life-of-Jesus Research and the Eclipse of Mythology", Theological Studies 54 (1993) p. 5; Charles H. Talbert, What Is a Gospel? The Genre of Canonical Gospels pg 42 (Philadelphia: Fortress Press, 1977); “The Historical Figure of Jesus", Sanders, E.P., Penguin Books: London, 1995, p., 3; Fire of Mercy, Heart of the Word (Vol. II): Meditations on the Gospel According to St. Matthew – Dr Erasmo Leiva-Merikakis, Ignatius Press, Introduction; Grant, Robert M., "A Historical Introduction to the New Testament" (Harper and Row, 1963) http://www.religion-online.org/showchapter.asp?title=1116&C=1230; "Main Body". Church.org.uk. Retrieved 2012-12-25. 1 2 Woodhead, Linda (2004). Christianity: A Very Short Introduction. Oxford: Oxford University Press. p. 16. ISBN 978-0-19-280322-1. ↑ Wright, N. T. (2008). Surprised by Hope: Rethinking Heaven, the Resurrection, and Mission of the Church. (youtube video). SPCK, HarperOne. ↑ "Gospel – Definition and More from the Free Merriam-Webster Dictionary". Merriam-webster.com. 2012-08-31. Retrieved 2012-12-25. ↑ "Saint Justin Martyr: First Apology (Roberts-Donaldson)". 1 2 Riches, John (2000). The Bible: A Very Short Introduction. Oxford: Oxford University Press. p. 45. ISBN 978-0-19-285343-1. ↑ Riches, John (2000). The Bible: A Very Short Introduction. Oxford: Oxford University Press. p. 46. ISBN 978-0-19-285343-1. ↑ Riches, John (2000). The Bible: A Very Short Introduction. Oxford: Oxford University Press. p. 52. ISBN 978-0-19-285343-1. ↑ Understanding the Bible. Palo Alto: Mayfield. 1985. 1 2 3 E. Sanders (1993). The Historical Figure of Jesus. Penguin Adult. ISBN 978-0-14-014499-4. ↑ Pogorzelski, Frederick (2006). "Protestantism: A Historical and Spiritual Wrong Way Turn". Bible Dates. CatholicEvangelism.com. p. 1. Retrieved 2006-07-11. ↑ "Canon of the New Testament". Catholic Encyclopedia. NewAdvent.com. 1908. Retrieved 2006-07-11. 1 2 3 Goswell, Greg (June 2010). "The Order of the Books of the New Testament" (PDF). Journal of the Evangelical Theological Society. 53 (2): 228–229. Retrieved 23 October 2011. ↑ D. Moody Smith, "John, the Synoptics, and the Canonical Approach to Exegesis", in Tradition and Interpretation in the New Testament: Essays in Honor of E. Earle Ellis (Grand Rapids: Eerdmans, 1987) 171. ↑ Charles H. Talbert Reading Luke: a literary and theological commentary 2002 p2 "(3) What exactly is Luke? The prologue (1:1–4) says it is a diegesis (account). The second-century rhetorician Theon defines diegesis as "an expository account of things which happened or might have happened". Cicero (De Inv. 1.19.27)"
↑ For a dissenting view, seeMark Goodacre. 1 2 Funk, Robert W. and the Jesus Seminar. The acts of Jesus: the search for the authentic deeds of Jesus. HarperSanFrancisco. 1998. "Birth & Infancy Stories" p. 497–526. ↑ "The Gospel of Mark" Retrieved 1 April 2013. ↑ Bromiley, Geoffrey W. (1959). The International Standard Bible Encyclopedia. Eerdmans. p. 281. ISBN 978-0-8028-3785-1. 1 2 3 Raymond E. Brown. An Introduction to the New Testament. ↑ C K Barrett, among others. ↑ Dunn, James D. G. (2003). "Altering the Default Setting: Re-envisaging the Early Transmission of the Jesus Tradition". New Testament Studies. 49 (2): 139–75. doi:10.1017/S0028688503000080. ↑ Pearson, Birger A. (2004). "A Q Community in Galilee?". New Testament Studies. 50 (4): 476–94. doi:10.1017/S002868850400027X. ↑ Schmidt, K. L. (1919). Der Rahmen der Geschichte Jesu. Berlin: Paternoster. ↑ Dibelius, M. (1919). Die Formgeschichte des Evangelium 3d Ed. Günter Bornkamm (ed). Tübingen: J. C. B. Mohr. 1 2 Bultmann, R. (1921). Die Geschichte der synoptischen Tradition. Göttingen: Vandenhoeck und Ruprecht. 1 2 Bailey, Kenneth E. "Informal Controlled Oral Tradition and the Synoptic Gospels". Biblicalstudies.org.uk. Retrieved 2012-12-25. ↑ Kelber, W. H. (1997). The Oral and Written Gospel: The Hermeneutics of Speaking and Writing in the Synoptic Tradition, Mark, Paul, and Q. Bloomington: Indiana University Press. p. 8. ↑ Gerhadsson, B. (1998). Memory and Manuscript: Oral Tradition and Written Transmission in Rabbinic Judaism and Early Christianity with Tradition and Transmission in Early Christianity Grand Rapids: Wm. B. Eerdmans Publishing Co.
↑ L Michael L White Scripting Jesus: The Gospels in Rewrite HarperCollins pg. 102. ↑ .Dunn, J. D. G. (2003). Jesus Remembered Grand Rapids: Wm. B. Eerdmans Publishing Co.
↑ Thomas R. Yoder Neufeld. Recovering Jesus: the witness of the New Testament p. 34, 52. Brazos Press, 2007. ↑ Maurice Casey, Jesus of Nazareth: An Independent Historian's Account of His Life and Teaching, p. 48. Continuum International Publishing Group. 2010. ↑ Howard M. Teeple (March 1970). "The Oral Tradition That Never Existed". Journal of Biblical Literature. 89 (1): 56–68. doi:10.2307/3263638. JSTOR 3263638. ↑ "The denial of Jesus' historicity has never convinced any large number of people, in or out of technical circles, nor did it in the first part of the century." Walter P. Weaver, The Historical Jesus in the Twentieth Century, 1900–1950, (Continuum International, 1999), page 71. ↑ The Myth about Jesus, Allvar Ellegard 1992; Craig Evans, "Life-of-Jesus Research and the Eclipse of Mythology", Theological Studies 54 (1993) p. 5; Charles H. Talbert, What Is a Gospel? The Genre of Canonical Gospels pg 42 (Philadelphia: Fortress Press, 1977); The Historical Figure of Jesus, Sanders, E.P., Penguin Books: London, 1995, p., 3; Fire of Mercy, Heart of the Word (Vol. II): Meditations on the Gospel According to St. Matthew – Dr Erasmo Leiva-Merikakis, Ignatius Press, Introduction; Grant, Robert M., "A Historical Introduction to the New Testament" (Harper and Row, 1963) http://www.religion-online.org/showchapter.asp?title=1116&C=1230; "Main Body". Church.org.uk. Retrieved 2012-12-25. ↑ Crossan, John Dominic (1995). Jesus: A Revolutionary Biography. HarperOne. p. 145. ISBN 0-06-061662-8. That he was crucified is as sure as anything historical can ever be, since both Josephus and Tacitus ... agree with the Christian accounts on at least that basic fact. ↑ James G. D. Dunn, Jesus Remembered, (Eerdmans, 2003) page 779–781. ↑ Funk, Robert W. and the Jesus Seminar. The Acts of Jesus: The Search for the Authentic Deeds of Jesus. HarperSanFrancisco. 1998. "Empty Tomb, Appearances & Ascension" p. 449–495. 1 2 Ehrman. Misquoting Jesus. ↑ St. Matthew , "The Thompson Chain-Reference Study Bible New King James Version", (B.B. Kirkbride Bible Co. Inc., 1997) p. 1258 verse 12:21, p.1274, verse 21:43. ↑ Frickenschmidt, D. (1997). Evangelium als Biographie: Die vier Evanelien im Rahmen antiker Erzählkunst. Tübingen: Francke Verlag. ↑ Hägerland, T. (2003). John’s Gospel: A Two-Level Drama?. Journal for the Study of the New Testament, 25(3), 309-322. ↑ e.g. Vines, M. E. (2002). The Problem of the Markan Genre: The Gospel of Mark and the Jewish Novel. Atlanta: Society of Biblical Literature. pp. 161-162. ↑ Stanton, G. H. (2004). Jesus and Gospel. Cambridge: Cambridge University Press. p. 192. ↑ Funk, Robert W., Roy W. Hoover, and the Jesus Seminar. The five gospels. HarperSanFrancisco. 1993. "The Gospel of Thomas", p 471–532. ↑ Ehrman, Bart (2003). The Lost Christianities. New York: Oxford University Press. p. xi. ISBN 978-0-19-514183-2. ↑ Achtemeier, Paul J., Th.D., Harper's Bible Dictionary, (San Francisco: Harper and Row, Publishers, Inc.; 1985). ↑ "The Gothic and Anglo-Saxon Gospels in Parallel Columns".